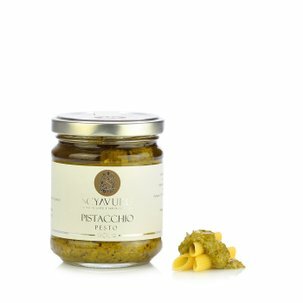 The unique flavour of Scyavuru Pistachio Pesto is due to the famous Bronte pistachios, extra-virgin olive oil and a pinch of salt and pepper. 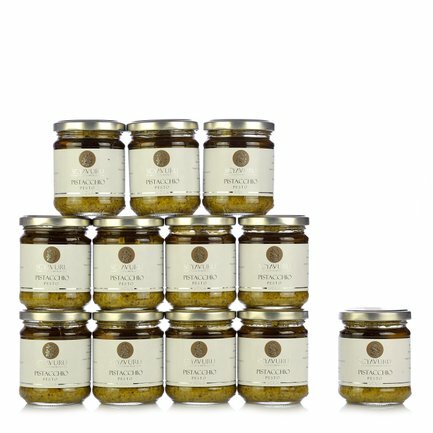 This original pesto is the ideal product for enhancing the flavour of your favourite pasta dishes, but is also excellent when paired with cheeses such as grana padano or mozzarella. By taking advantage of this unmissable offer, 12 jars of pesto will be delivered direct to your door and you will always be able to experience the flavour and scent of Sicily. A tip from Eataly: add a few toasted pine nuts or ground walnuts at the last minute to enhance the flavour of this sauce. Ingredients Pistachio Pesto 190g:Pistachio, Extra virgin olive oil, salt, pepper. ALLERGENS: Nuts and derived products (e.g. walnuts, hazelnuts, cashews, etc. ), pistachios.